Nottingham is not a very big city by any means, yet it is extremely popular. When I was a young boy, I didn’t know much about the places in England, except for maybe two or three; London, Manchester and Nottingham. The reason why Nottingham is so popular in the world is because of its links to Robin Hood, the famous thief who would steal from the rich and give to the poor. It is stated that Robin Hood used to reside near the areas of Nottingham, and if you visit the city of Nottingham, you are likely to come across a number of people who will say that they have firm belief that Robin Hood was a true character. Robin Hood’s story can’t be verified as being either true or false as yet, but what does stand true is the fact that Nottingham is one of the most beautiful cities of England. Nottingham rose to the global stage at the time of the Industrial Revolution, when the city underwent a massive change and developed numerous industries, the most popular of which were the bicycle, tobacco and lace making industries. Despite its small size, humans have been settled in Nottingham for quite a long while; dating as far back as 600 AD. Yet, the city charter was only given to Nottingham relatively recently; in 1897. At present, the urban areas of Nottingham have a population of around 729,977, making it the ninth largest urban settlement within the United Kingdom. For people who are visiting Nottingham, there are a number of sights to see and places to visit. The city is home to numerous football grounds and cricket stadiums, and the locals take a keen interest in sports activities as well. During the Anglo Saxon Period, Nottingham was a part of the Mercian Kingdom. However, a Saxon chieftain gave the city the name ‘Snotingaham’, which formed the roots of the official Nottingham name. The Saxon Chieftain, whose name was Snot, also brought people together in the area and settled here, in what is now the Lace Market. Then, the Vikings took over the city during 897. 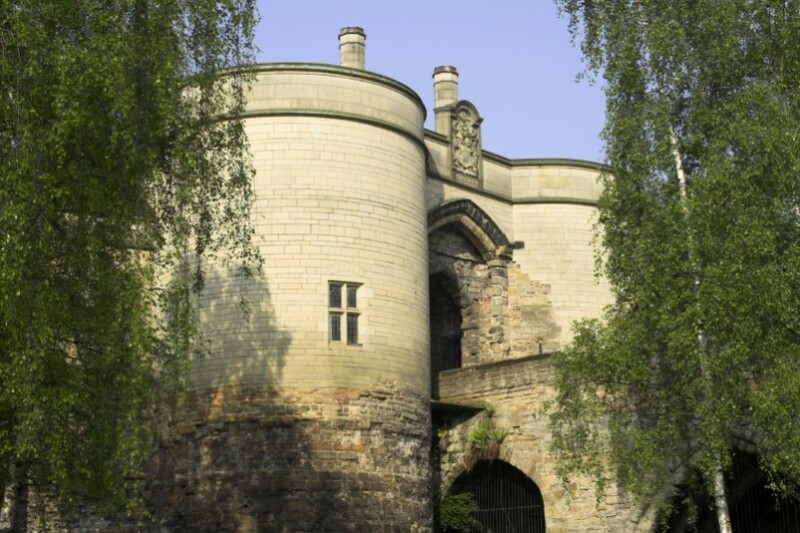 In the 11th century, one of the most iconic architectural buildings within the area were constructed; the Nottingham Castle. It was situated close to the River Leen. Nottingham continued to thrive, and by the 15th century had established itself as a famous center for export trade. As the Industrial Revolution hit England, Nottingham became famous for its textile industry, which thrives to this day. By 1901, electric trams were running around the city. They continued until 1936, when the expansion of the trolleybus network took place. However, trams were introduced again in Nottingham only in 2004, as a new network was established. Nottingham is an extremely peaceful city; people are friendly and you will find lots of things to do. Obviously, the locals take a lot of interest in football, with two local clubs in the city. Notts County was established in 1862, while Nottingham Forest, the other football club, managed to achieve worldwide acclaim from 1977 to 1993, as it managed to win numerous League titles and European Championships. When you meet people in Nottingham, you will notice that they are likely to ask you about your favorite football team, and the atmosphere on the weekends is all about football, as people flock to the local football stadiums. A number of places are present in Nottingham that are worth visiting, such as Rock City, which hosts a number of live venues and concerts. Then, there’s the iconic Nottingham Castle, having withstood the test of time and still stands strong today. You can also check out the Nottingham Playhouse, as the locals hold a deep interest in theater. The Nottingham Royal Concert Hall is also worth visiting, especially if an orchestra is in town. The City of Caves in Nottingham is a natural wonder and should definitely be checked out; these beautiful caves provide an insight in to the history of the city. The Galleries of Justice Museum is also a great place for people who are looking to learn about the historic culture of the city. The famous Nottingham Cathedral is definitely deserving of a visit too. Being a highly populated city, finding good Nottingham escorts isn’t difficult. There are hundreds of different escorts in Nottingham for men and women to choose from, and if you are looking for male or female escorts, then the choice available is plentiful. These escorts prove to be lovely companions as you visit Nottingham, and can also give you a private tour of numerous other areas such as the best pubs in town; something which your local guide will not tell you of. Nottingham escorts are definitely some of the best in England.